In this public seminar, Dr Jude Howell, Professor of International Development at London School of Economics and Political Science (LSE), argued that the securitisation of NGOs post-9/11 has raised both practical issues about aid delivery and the security of NGO workers, as well as broader questions around the purpose of aid and development of civil society. Dr Jude Howell is Professor of International Development at the London School of Economics and Political Sciences (LSE). She was Director of the London School of Economics and Political Science Centre for Civil Society between 2003 and 2010, running a wide range of internationally focused research projects and events on civil society. She was Director of the Economic and Social Research Council (ESRC) research programme on non-governmental public action and Series Editor of the Palgrave Press book series on Non-Governmental Public Action, in which her book The Global War on Terror, Aid and Civil Society (with Jeremy Lind), 2009, appears. She has written extensively on issues relating to civil society, development, security, gender and governance, and on China in particular. 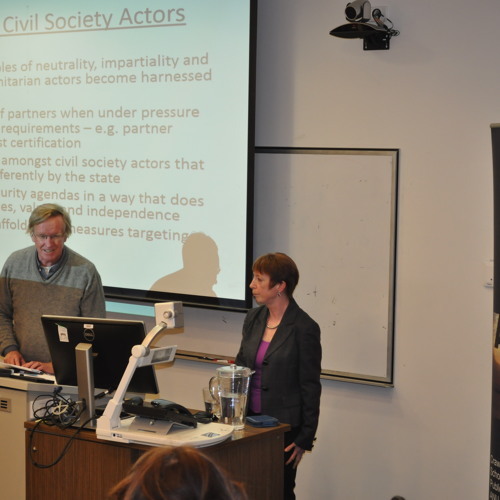 This public seminar was presented by the Development Policy Centre at Crawford School of Public Policy, The Australian National University.